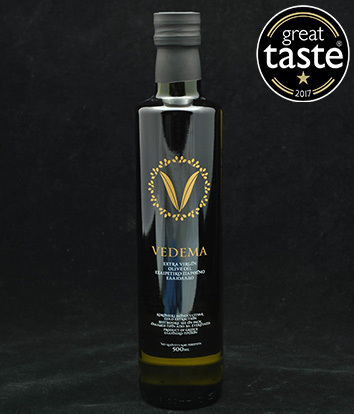 Vedema* is a fine example of the Greek extra virgin olive oils: «born» in the world-famous Kritsa olive groves in Lasithi, Crete in Greece, it is tasty and fruity, full of aromas and has a very low acidity (≤0.4%). The olive trees in Kritsa are traditionally cultivated since ancient times and harvested from November to early January, every year. Vedema is produced from hand-picked «Koroneiki» olive fruits, pressed whithin two days from harvesting. * The Cretans call vedema (βεντέμα) the full of fruit olive tree.